On this Pentecost Sunday, there are separate and multiple optional readings for the Vigil Mass and the Masses during the day. So this week, we will concentrate on the readings for the Sunday Masses during the day. 'Pentecost' is a Greek word meaning 'fiftieth day' and is the biblical feast commemorating the day God gave the Torah to the people of Israel. It was celebrated fifty days after the Passover Feast. In biblical times, all Jews of age were required to travel to Jerusalem to participate in the celebration. 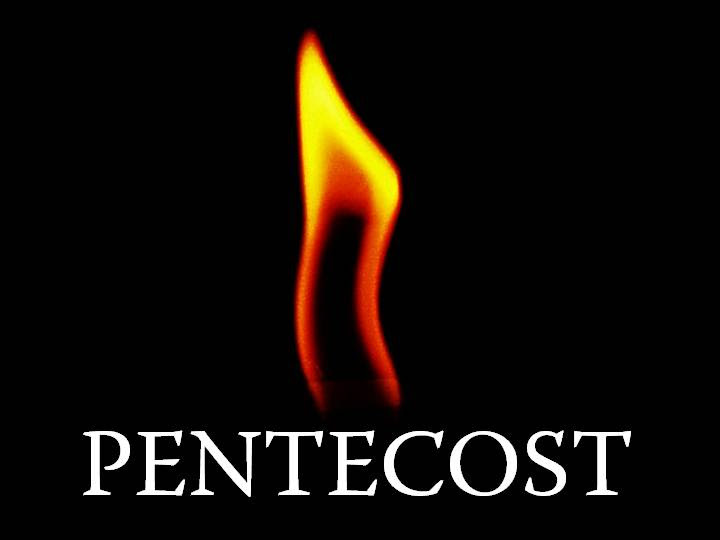 Pentecost Sunday is often referred to as the birthday of the Church - the day when we Christians became Church. Our first reading (Acts 2:1-11) tells this story vividly. Fifty days after Jesus' Passover supper, the disciples were celebrating the harvest festival of Pentecost or Shavuot (feast of weeks). Suddenly, the promised Advocate descended upon them and enlightened and emboldened them. Now there were devout Jews from every nation under heaven staying in Jerusalem. At this sound, they gathered in a large crowd, but they were confused because each one heard them speaking in his own language. They were astounded, and in amazement they asked, "Are not all these people who are speaking Galileans? Then how does each of us hear them in his native language? We are Parthians, Medes, and Elamites, inhabitants of Mesopotamia, Judea and Cappadocia, Pontus and Asia, Phrygia and Pamphylia, Egypt and the districts of Libya near Cyrene, as well as travelers from Rome, both Jews and converts to Judaism, Cretans and Arabs, yet we hear them speaking in our own tongues of the mighty acts of God." In our Gospel reading (John 15:26-27; 16:12-15) Jesus promised his disciples that the Advocate (Holy Spirit) would come. He "will guide you to all truth". Everything the Father and Jesus shared will be declared to them. Jesus said to his disciples: "When the Advocate comes whom I will send you from the Father, the Spirit of truth that proceeds from the Father, he will testify to me. And you also testify, because you have been with me from the beginning. In our Epistle reading (Galations 5:16-25), St. Paul exhorts his readers to live in the Spirit, not in the flesh. He then clearly outlines what each means. He highlights sixteen vices of the flesh and nine "fruits of the Spirit". If we live in the Spirit, we will evidence those fruits in our daily lives. Brothers and sisters, live by the Spirit and you will certainly not gratify the desire of the flesh. For the flesh has desires against the Spirit, and the Spirit against the flesh; these are opposed to each other, so that you may not do what you want. But if you are guided by the Spirit, you are not under the law. Now the works of the flesh are obvious: immorality, impurity, lust, idolatry, sorcery, hatreds, rivalry, jealousy, outbursts of fury, acts of selfishness, dissensions, factions, occasions of envy, drinking bouts, orgies, and the like. I warn you, as I warned you before, that those who do such things will not inherit the kingdom of God. This Advocate, the Holy Spirit came just as Jesus had promised. It was a thrilling and earthshaking event that changed the world. This "Spirit of truth who proceeds from the Father and the Son" lives and remains active in our world today. This is our prayer today and always, "Come Holy Spirit, fill the hearts of your faithful and kindle in them the fire of your love. Send forth your Spirit and they shall be created. And you shall renew the fact of the earth."